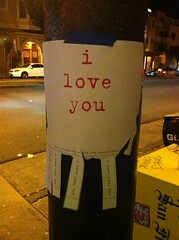 Flyers proclaiming their love for you have started appearing around the Mission. Is this some kind of viral marketing for a new romcom staring Adam Sandler? Someone’s unusual art project? The CIA’s new mind control experiment? Who knows. 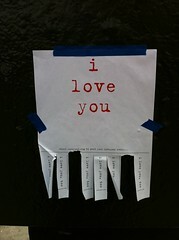 The posters direct you to visit LoveYou2.org, a mostly empty page which directs you to a rather sappy blog. Visit those links at your own peril: don’t say I didn’t warn you about the sappiness. 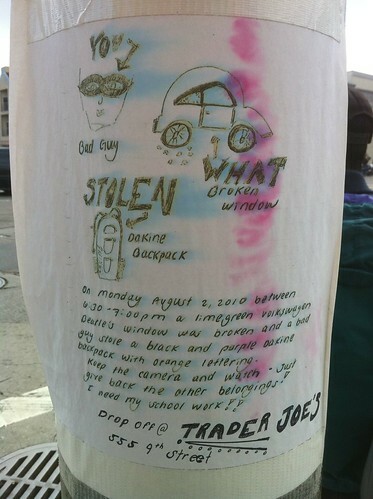 Spotted this strange poster on 14th St. yesterday, and I gotta say I’m a little baffled. It seems to be a record, a light bulb, and maybe some other symbols. Stranger yet, it was far above eye level — about 6 feet off the ground. 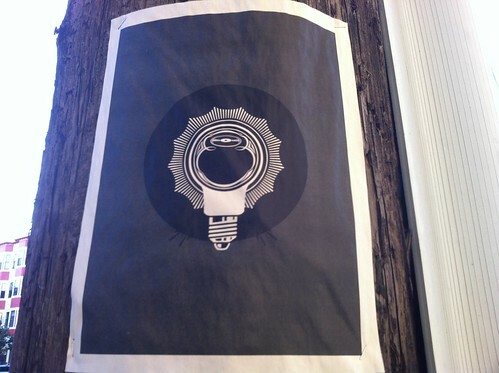 Anyone know what this poster is? Some kind of strange ad? An art project? Discordians at work? Sure, you could just put up a poster that says “stolen backpack: reward.” But that wouldn’t get anyone’s attention, would it? So they’re a student! Let’s hope for their sake that they’re not in art school.